Before the GS Boyz developed a case of "Stanky Leg," before Soulja Boy had folks doing the "Superman" and even before Cupid had us all doing their "Cupid Shuffle," there was this thing called Hip Hop and she was beautiful. Hip Hop still is beautiful, she's just going through some things right now; a transitional phase if you will. She'll be alright though. She always is. Like many other things in this nation's history, Hip Hop was born right here in New York City as the African and West Indian influences of beats, rhythms and speaking poetry over music collided with the traditional Blues and Jazz of decades past. It spread all over Harlem and the South Bronx at places like Club 371, on through Queens and into Brooklyn during a time in the early 80's when heroine, gangs and violence permeated the landscape. Just as Jazz was born not only from the post-slavery time period but also by what was evolving naturally in the New Orleans environment, so Hip Hop was also born from the post-civil rights time period and the eclectic New York environment. It was one of those things that was bound to happen at some point considering the nearly 20 million people who were packed together in the same metro area everyday, but looking back on how it got here we're reminded that it couldn't have happened any other way. Last night I had the honor and privilege of listening first hand to the history of it all chronicled by one of the greatest "baton carriers" (as he would classify himself) the Hip Hop community, and indeed the music world, has ever seen: Q-Tip. A good friend of mine and former co-worker by the name of Nick Rosenberg (shout out to Nick) has a brother by the name of Peter Rosenberg (shout out to Rosenberg Radio) who hosts his own show on Hot 97 with DJ Cipha Sounds (and of course, shout out to Cipha). They got together along with another friend and decided to put together an event called "Noisemakers," which is effectively the Hip Hop version of "Inside the Actor's Studio," only instead of James Lipton interviewing actors about the history of their professional careers in front of a live audience, Rosenberg interviews Hip Hop artists. Last night's guest: the infamous Q-Tip. 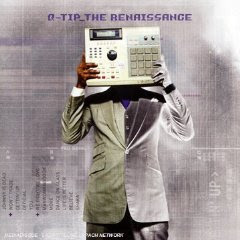 Recently, Q-Tip released his latest album entitled The Renaissance which is a must grab for all Hip Hop heads out there. It's one of those albums that you can let play from start to finish which we don't get too often anymore with all of these finger snappin' one hit wonders. Plus, he has some great collaborations on there with people like Raphael Saadiq, Norah Jones, Amanda Diva and, back from the dead, D'Angelo. Yes, that's right, I said D'Angelo. But as great as all of that is, that wasn't even the best part about last night. Not even close. No, the best part of last night was listening to Q-Tip talk about how he used to rummage through his father's old jazz albums to come up with Hip Hop tracks, how he was driven by his passion for music at a young age as a means to escape the nonesense that was going down out on the corner during that time, how he and Phife Dawg went to school together and just so happened to walk down to the studio one day and met De La Soul before De La Soul became De La Soul and before he and his friends would become the infamous A Tribe Called Quest. There were two things that really impacted me last night listening to Tip speak. The first thing that struck me was how small our world is. Although I wasn't born or raised in New York City, being in a large urban environment such as this one, as I'm sure my Philly blogger brethren can attest to, you are constantly reminded of how connected we are with everybody else. Tip was talking about how his high school buddy of years just nonchalantly mentioned to him one day during class that his uncle just so happened to be DJ Red Alert. Q-Tip said his jaw hit the floor because, ironically, this fact was mentioned to him after he had already been in the Hip Hop game for a few years looking up to the legends of the time like DJ Red Alert. And that was how he hooked up with Red Alert. Just like that. After that, he hooked up with Busta Rhymes, ran into Wu-Tang, Biggie Smalls, and the list goes on and on. All because they all had a common love to make Hip Hop. To further illustrate the small world point, I can still remember where I was when I heard all the Tribe classics like "Bonita Applebum," "Can I Kick It?," "Scenario," "Award Tour," and "Electric Relaxation." And I was a good 1500 miles from New York City at the time living back in the midwest. I'm sure many of my fellow Hip Hop heads reading this right now can likewise remember each of these songs and how they played into our lives growing up. And even though Hip Hop has taken on a few somewhat different forms and variations today, even the most attenuated of these fresh new 106 & Park artists were influenced by the baton that this chapter of Hip Hop passed on to them...even if many of them don't even realize it. 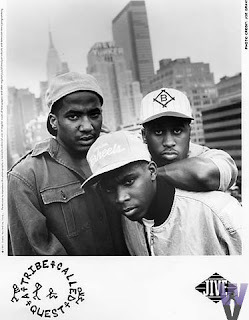 The second thing that struck me was how selflessly dedicated these cats were to Hip Hop. When Q-Tip and Phife and Afrika and the rest of them were all getting together to create this music, their primary driving force wasn't fame or fortune or even appearing in somebody's music video. It was simply for the love of Hip Hop. The one story that probably best illustrated this point last night was when Q-Tip described a young new artist trying to get a start who came up to him one night after a show with a demo tape. Many of today's artists who are arguably in this for the money are not concerned with wasting their time on listening to other people's demo music. Q-Tip, on the other hand, listened to it, liked what he heard, and gave the new guy a shot. That new guy turned out to be Detroit's very own Slum Village member, JDilla. When asked why he took the time to listen to the tape, Q-Tip replied that he viewed Hip Hop like one big marathon in which every artist has to do their part in taking the baton from the artists of the past and passing it on to the artists of the future. Spoken like true Hip Hop. Which begs the question, has the cancer of commercialization become untreatable at this point for Hip Hop, or do we still have enough artists out there who are doing this thing for the love of good music?